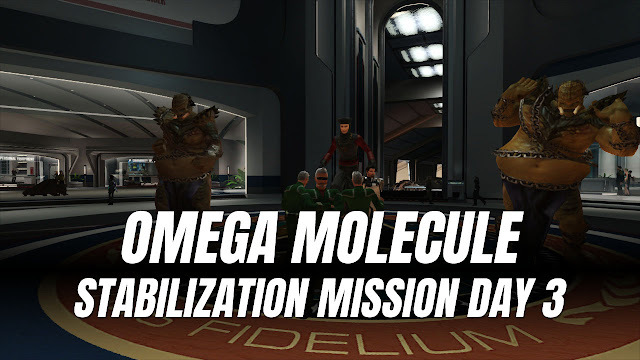 Star Trek Online 2019 • Omega Molecule Stabilization Day 3 - KABALYERO - PLAY, BLOG & EARN! Star Trek Online is celebrating its 9th Anniversary by letting the mysterious being Q give a T'Pau Scout Ship T6 in exchange for 1000 9th Anniversary Prize Vouchers. It's Day 3 of getting 40 #9thAnniversary Prize Vouchers by completing Q's daily mission called Omega Molecule Stabilization in #StarTrekOnline. The Omega Molecule Stabilization mission for today took place on the surface of Planet Vulcan, the space outside Earth Spacedock and in the space surrounding Starbase 39 in #StarTrek Online.